Welcome to the most distinctive island in the world! Santorini, this enchanting Cycladic Greek island, is a top once-in-a-lifetime tourist destination practically for any tourist. Santorini blends harmonically enchanting wild natural beauty with moments of tranquility and comfort. It is an ideal destination for those who love the magic of sunsets and want to get detoxified from the stressful reality of their everyday lives back home. Except the natural beauties and the great cuisine, villas in Santorini Greece are characterized for their distinctive Cycladic architectural style. The differential point of Santorini accommodation is the great Caldera view. Bare in mind though, that from all the villas to rent in Santorini, only the Oia Santorini accommodation can offer you the best Caldera views, since the Oia settlement is situated on the very peak of the Caldera cliffs. 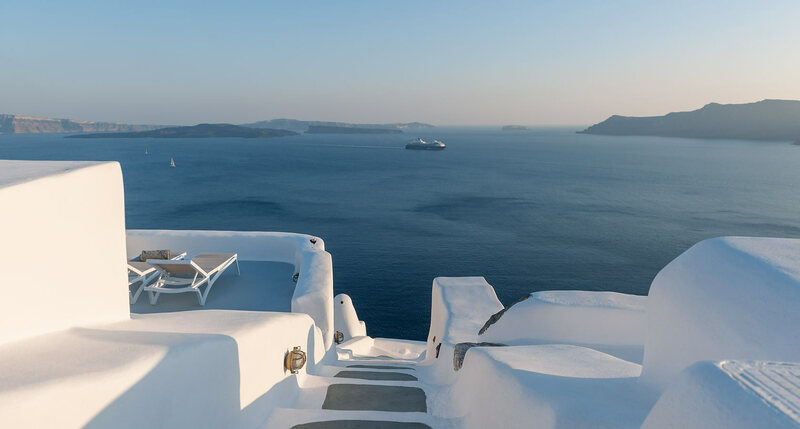 Therefore, one of the reasons why our villas rate as a top choice among other Santorini villas for rent, is the fact that they are situated on a privileged Oia location. 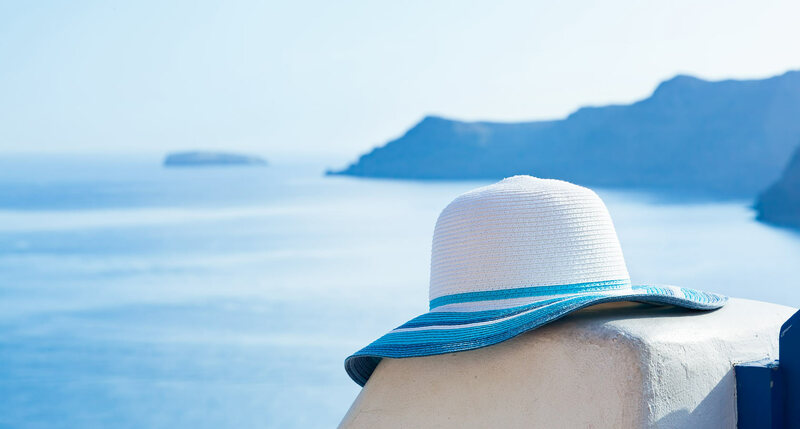 From their terraces, you can enjoy the tremendous views of the Caldera and the Aegean Sea. Our villas are very close to each other; just a mere 200m distance. The guests of our Santorini villas for rent feel privileged from the very first moment. Despite the luxury of enjoying one of the best sunsets in the world from the luxury of your private terrace, you will be even more thrilled when you will walk the white narrow cobblestone pavements and taste the local delicacies. Enjoying your holiday moments with the marvelous Caldera and the volcano in the background is something that you can experience only in Santorini! The deep rejuvenation and mental euphoria that you will feel while on the island, not only will ‘charge your batteries’ with positive energy, but we are pretty sure that will change the way you appreciate life and moments! Our villas can be found on Google Maps. If get a closer look you will realize that they are located on the peak of the Caldera. This way, they offer to their guests the exclusive privilege to enjoy the most beautiful sunsets in the world from the best spot on the island; the private terrace of their villa! Our villas in Santorini Greece are very easily accessible regardless of where in the world you may live. You just need to book an air ticket to either Athens or Thessaloniki and then you can get to Santorini either by plane or boat. Don’t wait..! 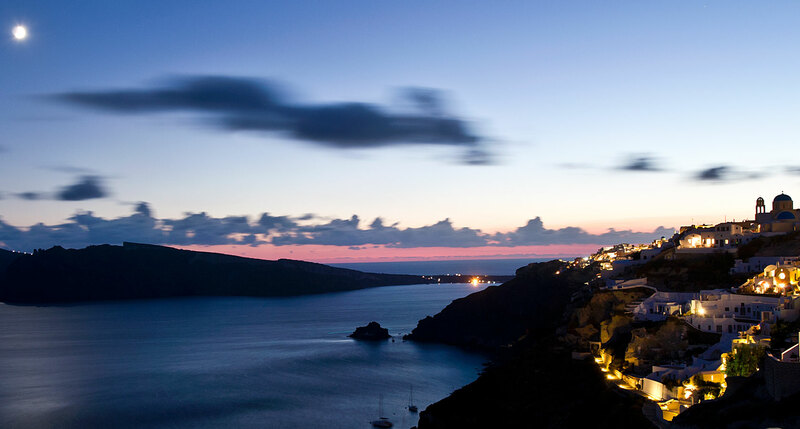 Book Now one or both of our villas in picturesque Oia and get ready for holidays of a lifetime! Below, we will explain how you can get to Oia, Santorini Greece. Santorini is being connected with many other Cycladic islands, Crete, and Skiathos, either by boat, flying dolphin, or plane. For more info, please contact either the airport or port of Santorini. The picturesque Oia settlement is connected with the Monolithos Airport and the Athinios Port via frequent local bus services. Alternatively, you can pick up a taxi or rent a car/motorbike from the car rental offices situated either at the port or the airport.